File Name: Malcom R. Willoughby of Baltimore, Maryland. Notes: Baltimore is a major US seaport and the state's largest city. 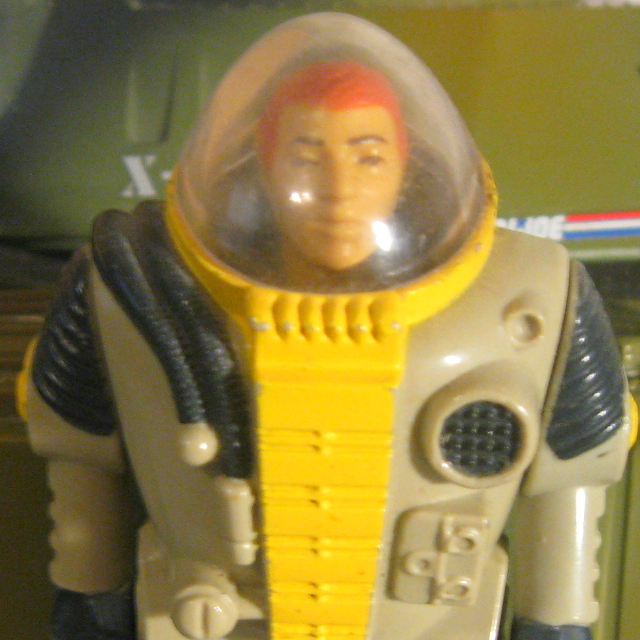 Sunbow's Deep Six wore his 1984 outfit, with hair lighter than on the figure (more sandy brown than red). The panels and grill on his chest were usually not detailed. Accessories: three-piece black bellows with string and clear tube (new). Deep Six never won any awards for being friendly. Became a Navy diver so that "I could be alone." Enjoys bottlecap collecting, solitaire and the New York Times crossword puzzles. Only 12 out of 50 Navy divers passed the strict requirements for the coveted diver position on the Joe Team. Eight washed out in the practical application testing. Of the 4 finalists, Deep Six could hold his breath the longest. Torpedo says: "Down in the depths where light doesn't reach and the water pressure can crush you like an eggshell - that's where Deep Six likes it!" Toy Notes: Item #6049. The least articulated vintage figure, moving only at the shoulders. Accessories: grey underwater spear rifle with scope (new), orange diving helmet with solid faceplate (new), black scuba backpack with segmented air hose on side (new), grey bell-shaped buoy (new), long black hose (common). Always a loner and an individualist, DEEP SIX rarely talks to his G.I. Joe teammates and barely remembers their code names, but his loyalty to the organization is unquestionable. He has recently given up crossword puzzles and bottle-cap collecting to devote his off-duty hours to recording and studying whale songs. He is a qualified underwater demolitions instructor and an avid supporter of public television. "Cobra is always coming up with new underwater specialists, none of which can fill Deep Six's flippers. 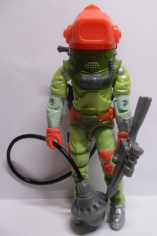 It severely cuts down on efficiency if, while sabotaging off-shore drilling platforms or trans-oceanic cables, Cobra divers have to constantly look over their shoulders to make sure that Deep Six isn't sneaking up behind them to cut their air hoses!" Accessories: black speargun (89 Deep Six's), large grey dolphin with white belly (new, "Finback"), pink large-footprint flippers with curved toe and ridge down middle (new), black figure stand (common). DEEP-SIX'S armored diving suit is built not only to withstand the pressures of deep water, but is specially coated to resist the corrosive action of the worst aquatic pollutants, including Cobra's toxic sludge! Unlike deep water suits of yore. Deep-Six's new suit benefits from new advances in metallurgy, ceramics, and bonded polymers to give him unparalleled freedom of movement and flexibility. 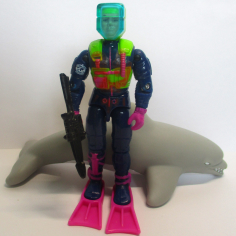 Together with his trained dolphin "Finback," Deep-Six can penetrate any underwater obstacle Cobra deploys on the ocean floor! Variations: A few (possibly only 24) early figures had a black and white orca instead of a dolphin. These probably did not make it to store shelves. Toy Notes: Features a temperature-based color change. Item #6821. In the 1992 insert catalog, concept art appears instead of the actual figure. Accessories: gold speargun (89 Deep Six's), neon yellow helmet (89 Deep Six's), black figure stand (common). Toy Notes: Available via the Menace in the Wilderness mail offer. Accessories: black silencer pistol (02 Shipwreck's), black speargun (83 Torpedo's), black knife with silver on edge of blade (04 Swamp Rat's), green dome helmet with clear face shield (08 Capt. Ace's), green vest with brown collar and black straps (08 Capt. Ace's), black Joe figure stand. DEEP SIX is a loner and an individualist who rarely engages in casual conversation with his G.I. JOE teammates. If he's on a mission, he's totally focused on the task at hand. Don't look for him to join a pick-up game of basketball; he prefers crossword puzzles and other solitary activities. He may keep to himself, but his loyalty to the team is without question and he gives everything he's got to help the team achieve victory. As a Master Diver, he ranks at the top in terms of experience and knowledge in all areas of underwater diving and salvage. If a dangerous undersea mission needs to be done, DEEP SIX is always the first to step forward. Toy Notes: Boxed in a Toys 'R Us-exclusive three-pack with Lt. Torpedo and G.I. Joe Cutter. Item #36145, set 2 of 3. Accessories: clear large featureless dome helmet (new), black bellows with black tube (84 Deep Six's), black Joe figure stand. "Of course it's cold, wet, and dark down there on the sea bottom, but that's the way I like it." Toy Notes: Boxed with a recolor of the S.H.A.R.C.. Item #32841. Accessories: clear helmet (08 Deep Six's), black bellows with black tube (84 Deep Six's), black Joe figure stand. DEEP SIX never won any awards for being friendly. In fact, he became a Navy diver so that he could "be alone." He enjoys solitaire, bottlecap collecting, and the New York Times crossword puzzles. Only 12 out of 50 Navy divers passed the strict requirements for the coveted diver position on the G.I. JOE team. Eight washed out in the practical application testing. Of the four finalists, DEEP SIX could hold his breath the longest. His unsociable behavior can be annoying (just ask WILD BILL), but when COBRA is on your back and you need a hand, DEEP SIX is there to help you out. "I've got this scene under control." Toy Notes: Carded in a two-pack with Ssgt. Rock 'n Roll and a reprint of Marvel #25. Item #37620.